The Governor of Małopolska has ordered the temporary closure of Cracovia Stadium to members of the public, following complaints from Małopolska Police that the management did not do enough to prevent illegal behaviour among fans during last Saturday’s Cracovia vs. Wisła derby. The closure will mean that fans will be unable to attend the next two matches of the Ekstraklasa league and follows a demand from police that the venue be shut down for the entire autumn season. The petition to Governor Jerzy Miller came after fans threw firecrackers and lit flares during the match – offences that can carry a five-year prison sentence. Police claim that fans and the club must take responsibility for enforcing these laws. 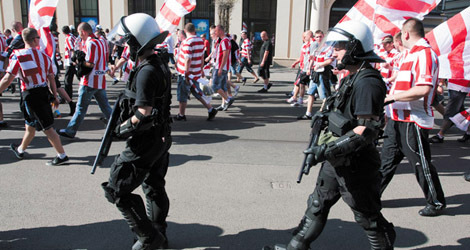 Cracovia’s management responded that they had fulfilled all legal requirements for public safety, and point out that police officers had checked match-goers for banned pyrotechnics before they entered the stadium. Governor Jerzy Miller’s issued a statement in which he said that the behaviour of fans and the passive attitude of Cracovia staff brought into question the safety of members of the public attending events at the stadium. The closure period will exclude spectators from two fixtures: the September 28 match between Cracovia and Pogoń Szczecin, and the October 20 match between Cracovia and Podbeskidzie Bielsko Biała. Cracovia fans have reacted angrily to the decision. Gazeta Krakowska reports that match-goers have described the derby as one of the most peaceful in recent years. Police have so far detained 14 persons in connection with alleged offences at the match and continue to study CCTV footage.